Big Hero 6: The Series begins near the end of the movie, with Hiro going to college and rebuilding Baymax. His body for Baymax is flawed and runs away. Meanwhile, Hiro’s friends Honey, Fred, Gogo, and Wasabi are moonlighting as their superhero alter egos. 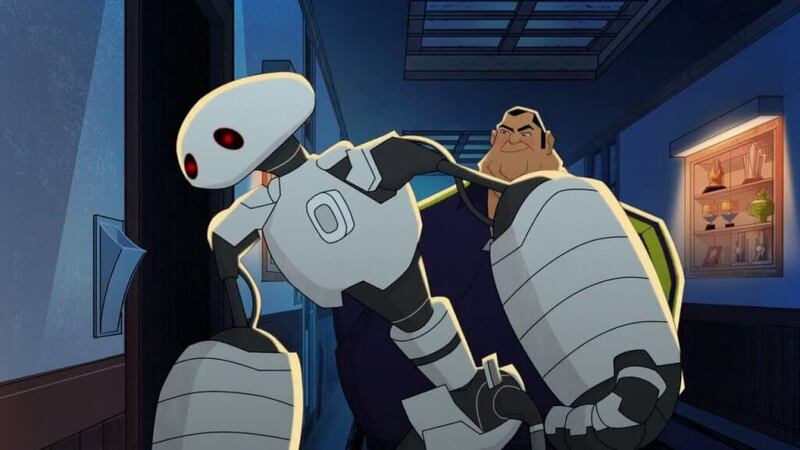 Baymax’s body ends up with the bot-fighter Yama, who makes a deal with Hiro: he’ll return Baymax’s body in exchange for a paperweight belonging to Professor Granville at the university. With Fred’s help, Hiro steals it, but Yama betrays him and locks them up. Their friends come to rescue them and Hiro steals the paperweight back. It’s revealed that Yama is producing replica Baymaxes. 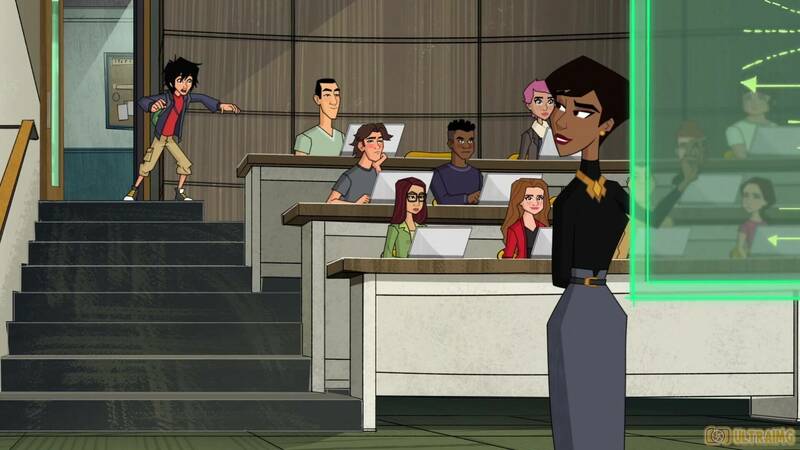 Professor Granville urges Hiro to follow in his brother Tadashi’s footsteps, making good decisions and studying hard. But Hiro is torn between his schoolwork and working on Baymax. He sneaks into Tadashi’s old lab to work at night after his classes. Yama sets his Baymaxes loose on the city and Hiro’s friends reluctantly spring into action. Hiro discovers that the attack is only a distraction, as Yama and some of his Baymaxes have infiltrated the university in search of Granville’s paperweight, which really has the ability to super-charge electronic devices and cause mass mayhem. Can Hiro and his friends get the paperweight back and defeat the Baymax copies? Disney’s spin-off TV series seem to be much better and more faithful to the original films than the ones they produced in the 1990’s for movies like Aladdin and Hercules. The animation is cleaner, setting it after the events of the film creates fewer opportunities for ret-conning and most of the voice casts have been returning for the newer shows. That being said, the voice actors for Fred and Wasabi — TJ Miller and Damon Wayans Jr. — did not come back for this series. Brooks Wheelan and Khary Payton take over their respective roles, with Ryan Potter, Maya Rudolph, Genesis Rodriguez, Jamie Chung and Scott Adsit reprising their roles from the original film. I really like the animation style for Big Hero 6: The Series. The character designs remain intact, but it’s distinct from the movie’s already unique style. Much like with Tangled, I think it was a good decision to animate this series traditionally. From what I’ve seen, computer graphics for children’s and family TV series leaves a lot to be desired. I’d rather watch these characters animated in a different format as opposed to a cheap imitation of the film’s animation. As for the story of “Baymax Returns,” I have mixed feelings. I think a TV series is the perfect way to continue this story, especially since there are so many characters to explore. I am loving the interactions between the team, as well as with characters like Professor Granville, who seems suspicious of Hiro (and rightfully so). But some things aren’t working for me, like taking bot-fighter Yama from the first film and turning him into some kind of a supervillain with an army of robots. I have no problem with giving minor characters a bigger role, especially in a TV series, but this just feels wrong. In the movie, he felt like more of a street hustler and petty criminal than a mastermind with minions and a lab. However, at the end of these episodes, we see a shadowy figure, presumably the main villain. I’m hoping he has something to do with the grander aspects of Yama’s plan and setup. That would be more believable than this thug becoming an evil genius. This is more of a nitpick, but it has always bothered me that, other than Hiro and Fred, we only know the team by their nicknames. I’m hoping at some point they’ll reveal Wasabi, Gogo and Honey’s real names. It could even be used to comedic effect. They seem to be giving Aunt Cass an even smaller role here than in the movie, but they could give her a solo episode at some point and I think that would be hilarious. Another thing that bothers me about “Baymax Returns” is the repetition of events from the film. These first two episodes, without commercials, are only about 42 minutes long combined. I don’t know why they feel like we need to see Hiro finding the original Baymax’s chip or the team flying into the sky at the end again. The dialogue is even exactly the same. In such a short runtime, I feel that showing events from the film over again is just a waste of time that could have been better used to set up Yama’s plan or even show the heroes hanging out. My guess is maybe they just didn’t know how to start and end the story, so they bookended it with familiar imagery and dialogue. Maybe this will play better to kids, but I found it distracting. I would say that the first two episodes of Big Hero 6: The Series met my expectations and the show so far is a suitable follow-up to the film. I would recommend seeing the movie first if you haven’t, for background on Hiro’s brother Tadashi and how the team got together. If you liked the original movie, I think you’ll enjoy this just fine. I’m looking forward to future episodes of Big Hero 6: The Series and hoping the other team members besides Hiro and Baymax get more of the spotlight. Big Hero 6: The Series - "Baymax Returns parts 1 and 2"
I would say that the first two episodes of Big Hero 6: The Series met my expectations and the show so far is a suitable follow-up to the film. I would recommend seeing the movie first if you haven’t, for background on Hiro’s brother Tadashi and how the team got together. If you liked the original movie, I think you’ll enjoy this just fine.